The Oil States Pipeline End Manifold (PLEM) and Pipeline End Termination (PLET) systems are typically used in new construction where a pipeline terminates or needs to be jumpered to another location, such as an FPSO, refinery, holding tank, etc. A PLET is the end or termination of a pipeline. The skid typically contains a male hub that serves as an attachment point for a jumper. The jumper utilizes a collet connector to make a permanent connection. There may also be other components on the skid such as ROV interface panels, ball valves and associated mud mats. 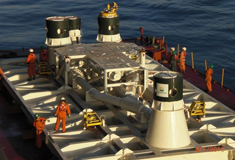 A PLEM serves as a manifold to split the product flow into multiple routes that may feed into an FPSO, refinery and holding tanks concurrently. A PLEM will contain such components as hubs, wyes, ball valves, ROV-interface panels and jumper systems that may include collet connectors, remote inline or articulating connectors (RIC/RAC), male end closures, etc. The export lines or jumpers can be hard piped or flexible lines that are connected to a gooseneck and swivel on the collet connector. Proven connector technology with simple ROV interface. Customized solutions to meet client-specific project requirements. Severe-duty components to withstand harsh, deepwater environments. Extensive FAT, SIT and DQT testing to ensure quality throughout.